Facial fillers are a popular option in nonsurgical facial rejuvenation. The two most commonly used fillers are Restylane and Juvederm. They are sometimes used alone but can also be used in conjunction with Botox. They are very safe methods of restoring lost volume under the surface of the skin. When they are placed in the correct position they help to reduce or eliminate wrinkles. They are most commonly used around the creases of the mouth and also to enhance the lips. How can facial fillers help me? Restylane and Juvederm have recently become FDA approved. They are injected under the skin after a topical anesthesia is applied. Discomfort is minimal, and results typically last nine to twelve months. These materials are most effective for reducing nasolabial folds, and wrinkles around the mouth and chin. They are also effective at reducing facial scars and depressions. One of the more recent advances using these fillers involved reducing or eliminating dark circles beneath the eyes. 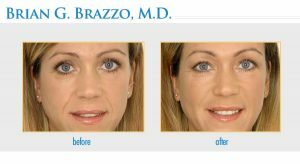 In order to determine your candidacy for facial fillers in New York, Dr. Brazzo will review your medical history and discuss with you the best uses for these products. Facial fillers are injected with a small needle directly into the area of concern after an anesthesia cream is applied. The injections are usually completed within one or two minutes. The effects are visible immediately. Most New York City facial fillers patients experience mild swelling, which typically lasts less than one day. The results are usually last for up to one year. Who should perform these treatments? 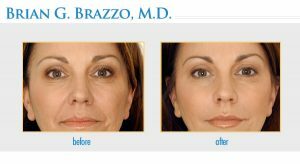 Dr. Brazzo is a respected New York City ophthalmic plastic surgery provider and has successfully administered thousands of Botox and filler treatments. He has extensive training as an ophthalmologist and oculoplastic surgeon. 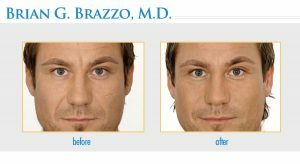 In fact, Dr. Brazzo teaches his techniques to other doctors through courses and books which he has written. See more facial fillers before and after pictures on the gallery page. 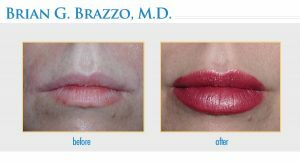 Dr. Brazzo’s advanced training enables him to perform cosmetic and reconstructive operations to improve their facial features. In addition to offering facial fillers, he is an experienced eyelid surgeon in New York City. Latisse New York City patients also visit him to obtain a prescription for this leading-edge eyelash enhancing medicine.